ALLEN PARK -- The Detroit Lions added a couple offensive linemen in the early rounds of Bob Quinn's first draft, and the unit didn't get better. So they added two more in free agency last year. And then they got worse. Sure, injuries hurt. There's no escaping that. But their offensive line coach also didn't do a good job. There's no escaping that either. There's a reason Ron Prince was the only assistant fired when the season ended. And there's a reason Jeff Davidson was hired to replace him. Prince was an old-school coach. That's one way of saying he was intense, and some would say to a fault. People who have been in that room say his message wasn't getting through. In Davidson, the Lions get the opposite in terms of temperament. "I think he understands the players," Lions GM Bob Quinn said. "He understand what offensive linemen go through. You can't treat everyone exactly the same in a room that big. It's one of the biggest rooms in the building, because you've got five guys that are starters, you have to have least eight on the 53, probably 10 total including practice squad. So your room has 10 guys in it. The only other room quite that big is probably defensive line or secondary. "So you got to have a presence. And you can't treat the 10-year vet the same as the rookie backup left tackle that you're trying to develop. So you got to have a real way to connect with these guys. And I think Jeff has that." Jeff Davidson was a fifth-round pick of the Broncos in 1990, and played five seasons in the league. So he understands what the guys are going through. He empathizes in ways other position coaches can't. And it helps. "He has a good feel of when to really grind the guys, and when to back off a little bit," Quinn said. "My mentality is -- and I think Matt (Patricia) would say the same thing -- is everything starts up front. So you expect a lot out of those guys. You want them to be physical for 70 plays a game. So you really got to be able to manage those guys, and what you do in practice, what drills you do in practice, how that relates to what you're doing in the team setting, and what you're doing in the meeting rooms. Jeff brings a wealth of experience with that." Former Lions offensive lineman Geoff Schwartz knows this as well as anyone. 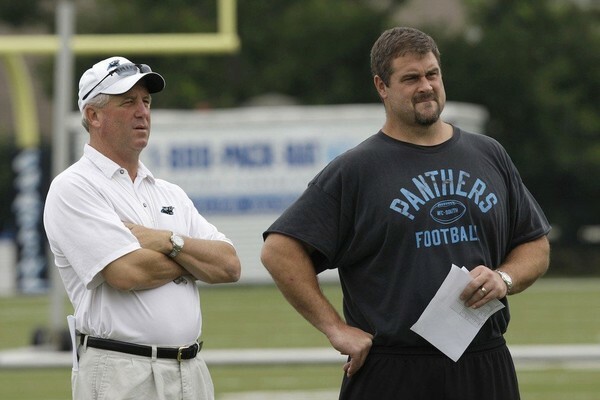 He played under Davidson at two stops -- in Minnesota, where Davidson was the offensive line coach, and again in Carolina, where he was the offensive coordinator. "He played football, and knows the game well," Schwartz said. "I think when you have a coach who has played the game before, they just have a different perspective. They're a calming influence because they know things happen during the game that, you know, you get beat sometimes. The defense sometimes outwits you. It happens. And the coaches that I've played for that have played the game are generally, like, 'Well, all right, we got beat on that play.' They're not going to yell and scream as much. They're not going to nitpick as much." Davidson got his coaching start with New Orleans in 1995. He joined New England as the tight ends coach in 1997, then worked his way up to assistant offensive line coach in 1998 and served as the tight ends/assistant offensive line coach from 2002-04. That means he worked alongside incoming Lions coach Matt Patricia for one year, in 2004, and it was Patricia who replaced him as assistant offensive line coach when Davidson left for Cleveland in 2005. He went on to serve as the offensive line coach for the Browns (2005), Vikings (2011-15), Chargers (2016) and Broncos (2017), plus had stints as an offensive coordinator in Cleveland (2006) and Carolina (2007-2010). In Detroit, he inherits a talented group that has struggled to meet expectations. Quinn added left tackle Taylor Decker (first round) and left guard Graham Glasgow (third round) in his first draft, then signed right guard T.J. Lang and right tackle Rick Wagner last year. But the Lions allowed 47 sacks in 2017, which was second most in the league, and paved the way for the worst rushing attack in the game. Some of that falls on the running backs of course. The Lions really suffered by not having a true between-the-tackles threat. But they also suffered from some of the worst run blocking in the league. According to Football Outsiders, they were the very worst. Then again, they lost Decker to a shoulder injury in May. And that proved to be a portent of things to come. Four-fifths of the line missed multiple games in 2017, forcing the Lions to start 10 different combinations up front. The top five started just two games together, and played just 95 snaps. But the good news is everyone except center Travis Swanson is due back next year. Swanson wasn't great anyway, and there is a growing belief that Glasgow will slide into the center position in 2018. And with so much experience back, plus a new voice to lead them, there is hope in Allen Park that the offensive line is headed for a bounce back season. "Offensive line-wise, I think we have good personnel," Quinn said. "I think there might be some changes, but the core group are going to be back at core positions, and I would hope those guys would improve. Some of those guys had injuries last year, and obviously we were without our left tackle for half the year. If a little of each of those things improve, the whole thing is going to be better."